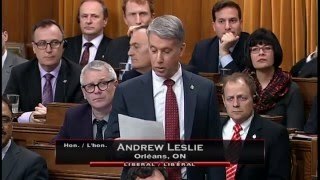 Added December 12, 2017 from Andrew Leslie. 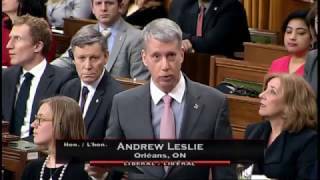 Added November 7, 2017 from Andrew Leslie. 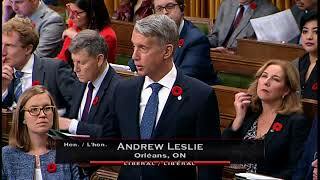 Added October 26, 2017 from Andrew Leslie. 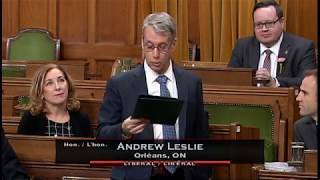 I rose to mark the 10th anniversary of the passage of the motion moved by the former member for Ottawa—Vanier, our friend Mauril Bélanger, to designate October as Islamic History Month. The aim of the commemorative month is to recognize the important contributions of Canadian Muslims to Canadian society, the importance of Canadians learning about each other to foster greater social cohesion, and the importance of efforts to organize public activities to achieve a better understanding of Islamic history. Today, celebrations and events are being organized across the country to bring together Canadians from all faiths and origins, to bridge communities, and to learn more about the accomplishments of our Muslim friends and neighbours. All Canadians are encouraged to take this opportunity to learn more about Islamic contributions to our great nation. 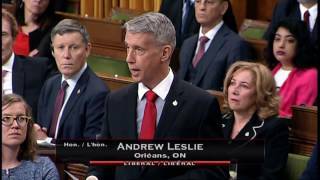 Added June 16, 2017 from Andrew Leslie. Yesterday, I rose in the house to echo the fact Canada has no closer friend, partner, and ally than the United States of America and to condemn it in the strongest possible terms the attack on the Republican baseball practice. I commend both Republicans and Democrats for their resolve not to let such a heinous act deter them from holding their annual bi-partisan charity game which went ahead yesterday. I know all Canadians wish those injured a complete and speedy recovery. 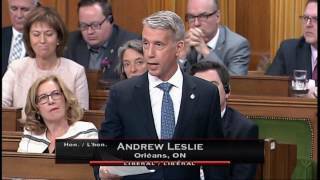 Added June 7, 2017 from Andrew Leslie. Yesterday, I rose to pay tribute to the brave soldiers, sailors and airmen and airwomen who fought to capture Juno Beach on June 6th, 1944. We can never forget their achievement and sacrifice in support of the great victory of that historic day. 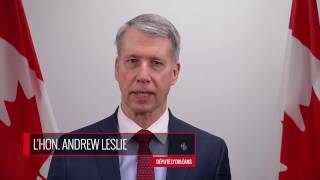 Added April 10, 2017 from Andrew Leslie. This weekend thousands of Orléans residents and people around the world will be celebrating the Easter holiday with their friends, family and greater community. La journée pascale est la plus sainte des célébrations chrétienne et souligne la mort et la résurrection Jésus Christ. This sacred holiday is an opportunity for us all to reflect on the meaning of Christ’s life: compassion and self-sacrifice in service of others, even our enemies. En se rassemblant avec notre famille et nos amis, souvenons-nous de lui et traitons les autres de la même manière dont nous désirons être traité, comme il nous l’a si bien enseigné. To everyone, of all faiths, in Orléans, on behalf of my family, the Government of Canada, and all those in the community, Happy Easter. Joyeux Pâques. 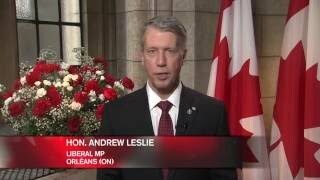 Added February 5, 2017 from Andrew Leslie. 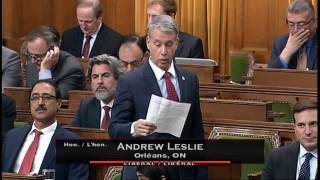 Added December 19, 2016 from Andrew Leslie. 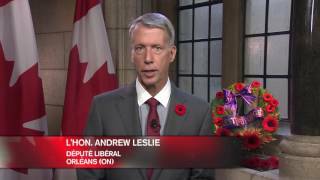 Added November 7, 2016 from Andrew Leslie. 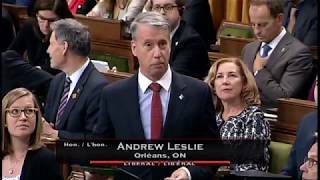 Added September 24, 2016 from Andrew Leslie. 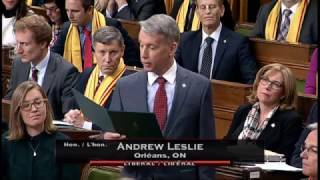 Added September 20, 2016 from Andrew Leslie. 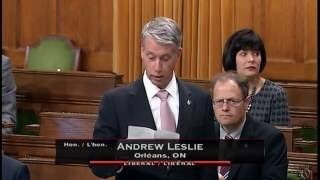 Added April 15, 2016 from Andrew Leslie. 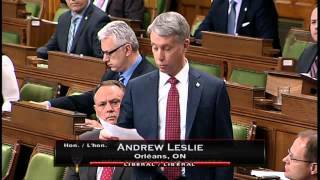 Added May 9, 2016 from Andrew Leslie. 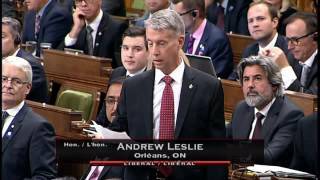 Added June 15, 2016 from Andrew Leslie. 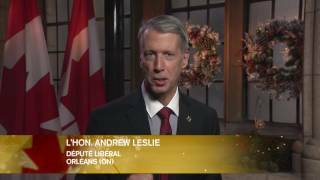 Added December 13, 2016 from Andrew Leslie. 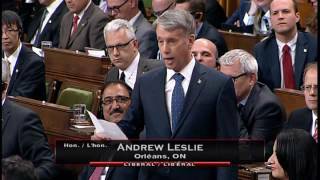 Added May 2, 2017 from Andrew Leslie. My statement on my friend and mentor, Colonel (ret'd) Arthury "Harky" Smith.